Lillian Boyd and Denya Hankerson, our representatives on the Prince George Electoral Board, spoke efficiently and accurately last night at the PG Dems meeting about the security measures in place to protect the vote in Prince George County, really across the Commonwealth. Their presentation covered the entire gamut, from the training of election officials, certification of the machines, the absentee, and in-person voting process, the Canvass of the vote the day following the election, and the actual certification of the vote. Both parties work so hard to get voters to turn out and actually vote. When those voters do vote, their votes must be protected and must count. Lillian Boyd has been the Committee’s representative on the Prince George Electoral Board for a number of years and Denya Hankerson was appointed. to represent our Committee this year, replacing our prior representative, Sharon Goertz. The representation on the Electoral Board is determined by the party of the Governor. The party of the Governor is allowed two representatives on the Electoral Board of each locality. The third seat is held by the other major party. Each committee presents its nominees to the Circuit Court Chief Judge by letter and if satisfactory to the Judge the representative is then sworn-in to serve a four-year term. We have been fortunate to have such competent and committed representatives to our Electoral Board. On February 1, 2018, Denya Hankerson became our Committee’s second representative on the Prince George Electoral Board when she was sworn-in by Bishop Knott, Circuit Court Clerk. She joins our other member, Lillian Boyd, on the Electoral Board. There is one Republican on the Board, Mrs. Barbara Tabb. We had hoped the swearing-in could be in the courtroom, but there were preliminary motions occuring there in a murder trial. YIKES! Each locality’s Electoral Board is responsible for supervising elections in the county, training of election officials, and ascertaining the vote after every election. It is a time consuming and terribly important job, especially in these times. We thank Sharon Goertz, who served as one of our representatives on the Board for a number of years. Sharon, a writer, has been stalwart in attendance to her duties while on the Board and we appreciate her selfless service. Denya replaces Sharon on the Electoral Board. Tonight, February 1, at 6 pm, the Committee will meet to elect officers and to attend to other business matters. The meeting is at 6450 Administration Drive, Prince George Human Services Building, 1st Floor Meeting Room. See you there. The 4th CD Committee of the Democratic Party of Virginia will meet on Feb 3 at Noon at the Virginia Diner in Wakefield for the primary purpose of determining the selection method of our 4th Congressional District Nominee. The meeting is open to the public, and you are welcome. Please let Carol know if you plan to attend so that she can assure adequate seating. Meals can be ordered at the individual’s cost. 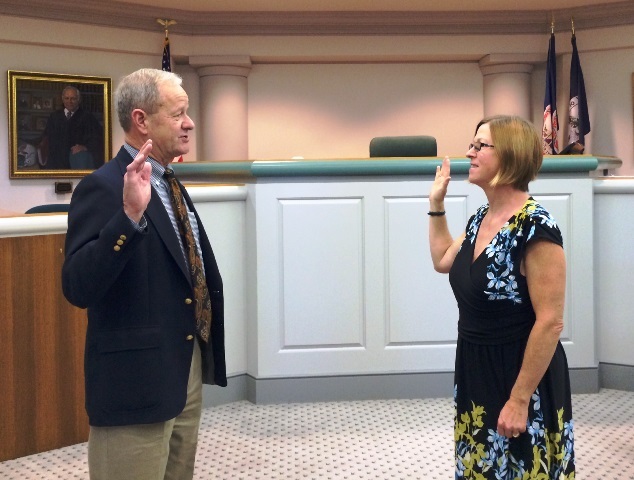 The Circuit Court appointed Prince George Democratic Committee member, Sharon Goertz, to the Prince George Electoral Board. She was sworn in by Circuit Court Clerk Bishop Knott on February 19th in front of a number of the PG Dems. Every locality in Virginia has a 3 member Electoral Board. The majority on each Board must be members of the newly elected Governor’s political party. With the election of Democrat Terry McAuliffe, the Republican representative, Brenda Kreider, rolled off of the Board. The Prince George Virginia Democratic Committee then nominated three members to be considered by the court for appointment to the Electoral Board. Traditionally, the first name on the submitted list is considered the preferred candidate by the Committee. Sharon has served for a number of years as an election official at the polls on election day and has assisted the Committee and a number of Democratic campaigns with data work. She joins Prince George Democrat Lillian King Boyd, currently the Secretary of the Prince George Electoral Board. Don’t forget the next meeting of the Prince George Democrats, March 6, 5:30 p.m., Prince George County Administration Building, 66o2 Courts Drive, Prince George, 2nd Floor.